On Monday, 22 February 1882 (OS) in the morning, just when the clerks, traders, professors and students were about to take a break in the warm pre-spring sun, everybody stood to a halt, listened and looked up, as if they wanted to ask flocks of frightened sparrows and pigeons what had happened. Right after that, from the direction of the Parliament, hummed the joyful voices and cries. Waves of people who had gathered in no time, flooded Terazije square and stopped in front of the Palace. 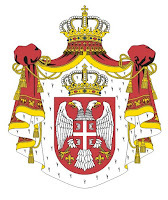 At that moment, the Parliament proclaimed Serbia a kingdom, and Prince Milan Obrenović IV – the King of Serbia, Milan I. By proclaiming the Kingdom, Serbia got not just the royal titles, but many institutions of culture as well. The Lyceum became The Advanced School, the law on compulsory elementary education and organization of high-schools was passed. Serbian Learned Society became Serbian Royal Academy, with Josif Pančić as its first president.